I love everything about 'tickle the imagination', as I am sure you do too, but I especially LOVE the name. As a creative business owner I believe tickling the imagination puts the beauty into the world, that gives ourselves and others the oooh & ahhhs. But it is also what gives us our own unique style as a person, it's the thoughts and ideas that lead us to who we are. BUT, how many of us really use out imaginations today? Or truly living a creative life of what you love as an individual? Let's face it, we are obsessed with movies, television, celebs, the internet & especially social media. I am not here to judge. I too, am guilty of all these pleasures. But with so much stimulation at our fingertips, it's easy for our imaginations and tastes to be influenced. Or even lose a little bit of it. So ... let's tickle our imaginations. Let's step up and be authentically you. If you're feeling a little like there is more style and brilliance to you, it's time to step up and own it. You know you were born to secretly show your amazingly authentic style. + Become conscious of your true inspired loves, whether they are in vogue or not. + Inspire yourself and develop your own style. + Take notice of what you naturally gravitate towards, in the form of shapes, colour, texture, imagery, photography, cooking, concepts etc. + Take notice of how you feel when you see something you adore. Does it give you butterflies? These are intuitive signs of who your really are, what you truly love - they're indicators of your style. Thinking about what ignited your imaginations as a child. What was it you loved to do? Tapping into this, using a little imagination and becoming visually aware of this, is a wonderful way to discover your own unique style. It's perfect for creative business owners so you can develop a product range, that is 100% uniquely you. It's also brilliant on a personal style level. From the way your dress, to how you style your home, even what you cook. Using your imagination, rediscovering your unique style is so rewarding & not to mention whole lotta fun. 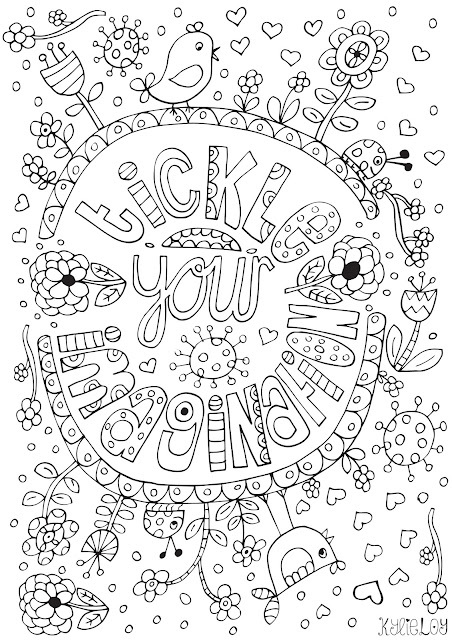 Click here to download a copy of Kylie Loy's colouring page - we'd love to see your finished artworks!